Based on reviews from 421,682 users. Learn how our rankings work or see our guide to Vans sneakers. Updated Apr 2019. The history of the world’s most famous skateboarding shoe company started in 1966. But before the rise of the popular Vans sneakers, the story started with Paul Van Doren quitting school at 14. The eighth-grader was adamant at going back to school and instead ended up as a cleaner and erstwhile shoemaker at Randy’s, a US footwear maker. 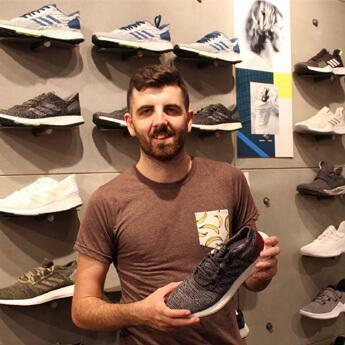 While Paul worked his way up the company, he eventually became its Executive Vice-President at 34 years old as the company grows as a major shoe manufacturer in America. But Paul Van Doren’s journey into shoemaking didn’t end up there. He wanted to make his brand of shoes with the Van Doren Rubber Company. On March 16, 1966, Paul and his brother James Van Doren and business partners Gordon Lee and Serge D’Elia opened the first Vans sneakers factory retail store at 704 East Broadway in Anaheim, California. What has made Vans sneakers unique is that it is designed and manufactured in the same store and directly sold to the public. On opening day, the first Vans sneakers were rolled out with 12 customers buying deck shoes. The design of the shoe that was first purchased was the #44 deck shoe. A simple plimsoll design with a canvas upper and a vulcanized rubber sole, the Vans Authentic was priced $4.49 and was masterfully crafted and picked up by customers on the same day. It is interesting to note, however, that Paul Van Doren and Gordon Lee forgot to have enough cash for change that the customers were told to get their shoes and return the following day to pay for their shoes. All 12 customers were able to come back the next morning and paid for the first pairs of Vans Authentic ever released. In the early 1970s, the relationship between Vans and the skateboarding community began when some skateboarders started to patronize the rugged makeup and simple design of the Vans sneakers, particularly the Authentic. The sticky sole adheres well to the wooden boards, and the vulcanized construction doesn’t wear out quickly are what convinced skaters that the Vans sneakers are the best for their jumps and tricks. Soon skateboarders all over Southern California were donning a pair of Vans. The transition from being a regular deck shoe and becoming a permanent fixture in skateboarding culture began when skateboarding greats Stacy Peralta and Tony Alva wore the skate kicks in community parks and competitions together with several hundreds of other skaters who have come to love the Vans sneakers brand. In 1976, the company collaborated with Peralta and Alva to design entirely new Vans sneakers that would suit the needs of the 1970s skating generation. While the Vans Authentic had a rugged upper and a vulcanized sole adapted for board tricks and jumps, the design felt stiff and less protective of the ankles. Vans tapped Z-Boys members Peralta and Alva who helped create a skate-friendly version that highlighted additional padding in the collar for improved comfort. The initial design for the Vans Era was released in March 1976 with a canvas upper, and a rubber gum outsole finished with double stitching and added padding for enhanced comfort. At the onset, skaters can only own a pair of the Vans Era in navy blue and red colorways with some versions in two-tone iterations of the red and blue. Known as Style #95, the Era, later on, had several colorways as part of the company’s diversification of the Vans sneakers style. The Vans Era was also instrumental in the rise of the company’s “Off the Wall” slogan with the signature red-and-white skateboard logo of the company plastered at the heel. The first version of the Vans skateboard logo was created by the co-owner and president James Van Doren’s 13-year-old son Mark in Costa Mesa, California. Mark designed the skateboard logo as a stencil to be spray painted on his skateboards. The signature logo was placed on the heel tab of the Vans Era for the first time. The ‘Off The Wall’ slogan of the company was initially meant pulling off jumps and aerials off the rim of drained pools. The stunt, performed by skateboarders while wearing their sticky-soled Vans sneakers would eventually hold that on March 16, 1976, the Off The Wall logo was placed with its red and white combination. But over the years, Vans sneakers have evolved from being just a skating brand. The company has diversified offering shoes and apparel for BMX, surfing, and snowboarding. The Off The Wall slogan has also evolved to mean a gravity-defying moment for the brand which symbolizes the wearer’s freedom to do whatever they want. The iconic side stripe has been part of Vans sneakers heritage since the release of the famous Vans Old Skool. Making its debut some four decades ago, the Sidestripe was a brainchild of Paul Van Doren, the company’s founder who made a doodle of the design and eventually placed them at the side panels of the Old Skool. The signature Sidestripe was also first called as the Jazz Stripes. With Style 36 or the Old Skool as its first vans sneaker to don the famous stripes that do not only add to the overall look but also a multi-paneled feature to make the shoe extra durable. A well-known American skateboarding shoe brand, it is often difficult to classify Vans sneakers aside from being skate-inspired. But more than meets the eye and as part of the brand’s objective to offer variety, Vans sneakers were provided in various categories based on cut and actual use. Before the high and mid-tops became a favorite among professional skaters, low-top Vans sneakers have been the norm. Low-Top sneakers are sneakers that do not cover the ankles with minimalistic design and structure. They are often characterized as lightweight, affordable, and versatile when it comes to styling options. Since the majority of Vans sneakers are of canvas and leather material, they are low-maintenance, accessible to style, and guarantees more flexibility and freedom of movement. Some variations of Low-top Vans sneakers have padded collars like the Vans Slip-on and the Vans Era. Meanwhile, other shoes like the Vans Authentic, Vans Chukka Low, and the Vans Old Skool have thin or lesser padding at the collar. Many shoe critics say the mid-tops are the result of endless customization of low-top and high-top sneakers as they fall into these two categories. These shoes often go up to the ankle level and never above it. While many sneakerheads often find them confusing when brands do not explicitly state if it is a high-top or a mid-top. The most famous mid-top in Vans’ sneaker portfolio is the Vans Half-Cab. The canvas and suede shoe, which is often dubbed as the best skate shoe ever produced, is a result of the signature Caballero high-tops cut up to the ankle. After Vans legend Steve Caballero noticed that many pro-skaters cut his signature shoe up to the ankle and tape them to make them lighter, flexible and less constricting of movements, he decided to call on Vans to do something with the trend. 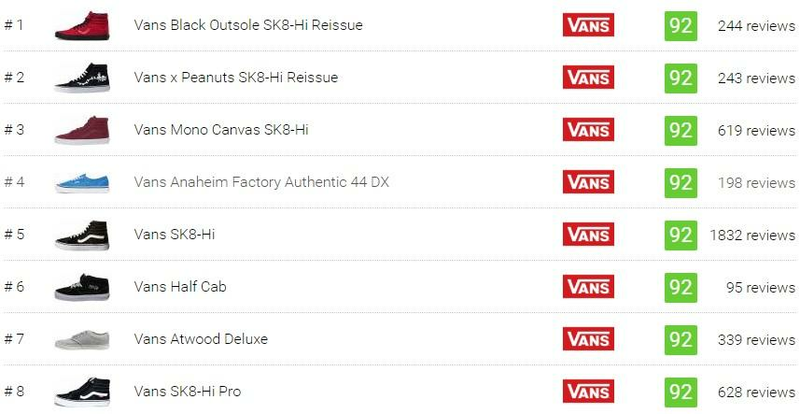 Other favorite skateboarding kicks also being released in mid-top version is the Vans Sk8-Hi with the SK8-Mid Pro. Another mid-top lifestyle sneaker is the boot-like Vans Desert Chukka with a snug fit and premium leather materials. Distinguished by the collar that extends over the ankle, pro-skaters often use the high-top sneakers from Vans. The high-tops are ideal for those who would want extra ankle protection with additional padding like the fashionable SK8-Hi sneakers. Other high-top Vans sneakers that were iterations from classic silhouettes include the high top version of the Atwood with its padded collars. The high-top sneakers are often with laces over and above the ankles supported by straps to further enhance fit. While high-tops are considered stylish and usually fashionable, many have claimed the above the ankle collar limits the shoes’ versatility and could be limited in movements. The classic silhouette that has made a mark in the Vans sneakers legacy for years have been kept relatively the same through the years as many skaters tend to value the minimalist, the traditional, and often classic-looking sneakers. While the OG shoes may have had new treatment in materials, the silhouette is kept the same for their loyal patrons to recognize the pump for the years to come. Among the Vans classic skate sneakers include the Vans Authentic, Vans Era, Vans Half Cab, Vans Classic Slip-On among other favorite shoes on the line. As the House of Vans slowly transitioned from being a serious player in the skateboarding culture, so goes their shoe designs. Vans sneakers became a professional skating brand when the likes of Tony Alva and Stacy Peralta of the Z-Boys first helped design the iconic Vans Era, one of the most loved skateboarding kick off a generation of skaters. As soon as many skateboarders early knocked on the doors of the Van Doren Brothers’ store in Anaheim, the company started to craft shoes specifically for the needs of their most avid consumers. The Vans sneakers vulcanized design were given thicker foxing, grippy soles, cushioned ankles and sock liners, and the highest level of impact cushioning to address the needs of its growing skateboarding clientele. Among the brand’s most popular professional skateboarding designs include the Era Pro, SK8-Hi Pro, Kyle Walker Pro, Half Cab, and Old Skool Pro. Aside from skateboarding, Vans also ventured into other active sports like surfing, BMX, and snowboarding. While the sales of these shoes are a small percentage compared to the lifestyle and professional Vans sneakers, the American brand that popularized the skating culture soon also opened its doors to other active sports. Among the surf shoes currently being sold in the Vans sneakers portfolio are the UltraRange, Chauffeur, Bali, and Desert Chukka and Low in surf-ready design for some stylish beach walking. For snowboarding, Vans also released high-top snow boots like the Verse, Infuse, Sequal, Aura, Encore, and Hi-Standard. What sets the company’s shoes apart from those released in the 1960s to the 1980s is that Vans sneakers have the option to be customized. The degree of customization was trailblazing as many footwear manufacturers were soon copying this feature of Vans sneaker customization. The customization feature was an offshoot idea when skateboarders went to the Vans factory and store in Anaheim to have just a left pair manufactured, or sought a specific color or canvas print to their shoe. A tradition since 1966, Paul Van Doren made shoes with any fabric people brought by the shop. The Vans Customs feature remains an option for creative minds to turn their designs and creations into reality. With Vans Customs, buyers can quickly pick a shoe, choose colors and patterns, and make them exclusively personalized to the wearer’s liking. Known as Vans’ premium label, Vans Vault line is composed of styles taken from the company’s extensive 50-year old or vault of designs. The classic styles are featured in an often modern twist inspired by art, music, street, fashion, and creative world of surf and skate. Every season shoe designers from the company decide which Vans sneakers will be given modern treatments by influential artists and brands by creating unique and often difficult to cop pairs of the collaborators’ most popular styles. Among the famous Vans Vault makeovers include the Vans TH OG Classic Slip-On 59 LX, Vans TH Mid Skool LX, Vans x Huichol Capsule, and the Pendleton x Taka Hayashi x Vans Slip-On. Also known as the No. 44 deck shoe, the Vans Authentic has a simple layout with the canvas upper and a thick vulcanized rubber sole. But this simplicity is probably the reason why skateboarders loved it in the first place. Known for the laidback lifestyle, skateboarders love the simple silhouette with only the upper’s canvas material changing colorways through the years. Aside from being an everyday canvas Vans sneaker, the Authentic had several makeovers through the years with collaborations with several retailers and designers. Some of the most popular of these collaborations for the Authentic and other designs include Deluxe x Vans Authentic, Supreme x Vans x Campbell’s Soup, Vans x Peanuts Authentic, Supreme x Comme Des Garçons x Vans, and Fear of God x Vans Authentic. The most bestselling and iconic sneaker of all time in the Vans sneaker arsenal is undoubtedly the Old Skool. The Vans Old Skool was initially created for skateboarders of the 1970s by the Van Doren brothers under its original style name Style 36. Now with millions of pairs of this skate cult classic sold, many sneaker fans predict that the Vans Old Skool might soon knock off the Adidas Stan Smith on the top spot as the most bestselling sneaker of all time. The low-top design for the Old Skool was first seen in 1977 as a follow-up to the Vans Era. It was also the first shoe of the company that features the now recognizable leather stripe that is stitched at the side panels. What further sparked the interest of skaters into patronizing the Old Skool are its sticky waffle soles that grips easily into then wooden boards used in skateboarding. Another factor that helped retain an interest in the Old Skool is the level of customization that one can get from buying and Old Skool kick. In the 1980s to the 1990s, the shoes were being customized by skaters by spray painting, doodling, and creating new artworks on the canvas upper. Today, the Old Skool remains to be the most coveted silhouette in the Vans portfolio. It has also given several makeovers through collaborations such as BLENDS 36 Old Skool LX, Concepts x Vans Old Skool, Vans x Golf Wang Old Skool, Supreme x Vans Old Skool x Comme Des Garçons, Vans x NASA, and Coutie x Vans Old Skool Post Mortem. The Era is Vans first skate shoe. To further improve the Vans Authentic design, the company tapped Z-Boys members Tony Alva and Stacey Peralta who made a skate-friendly version that featured additional padding in the collar. The first design for the Vans Era was released in 1976 with a canvas upper and a rubber gum outsole with double stitching and extra padding for enhanced comfort. The Vans Era, later on, had several colorways as part of the company’s diversification of the style. The Era was also instrumental in the rise of the company’s “Off the Wall” slogan with the signature red-and-white logo of the company plastered at the heel. Among the most popular colorways and collaborations of the Era are the Navy Blue and Red colorways, Brain Dead x Vans Era, Vans Era x Liberty Art Fabrics, Vans x Fear of God Era 95 DX, UNDERCOVER x Vans Era, and FDMTL x Vans Era sneakers. The 1970s is a game-changing year for Vans sneakers with the introduction of the Classic Slip-on. The design first came out as plainly colored canvas shoes in 1977, but its popularity took off when Sean Penn wore the shoes as Jeff Spicoli in Fast times at Ridgemont High in 1982. Paul Van Doren’s son Steve Van Doren recalls that they noticed skaters coloring the rubber midsole and later on the canvas upper of their shoes with a checkerboard design. As the company continued to listen to thousands of their skater patrons, the company created the iconic checkerboard look of the slip-on. The Vans Classic Slip-on has elastic side accents and padded collars for additional comfort while the signature flag label and high-grip waffle outsoles complete the look of this bestselling design. A sneaker fan favorite among skater and BMX riders, the shoe is built specifically for the on the go and no-frills lifestyle of skaters and active sports enthusiasts who would like to wear their Vans sneakers at the fastest possible time without worrying on lacing them up or get it tangled. The Vans Classic Slip-on were also given various treatments through the years with collaborations with top designers and artists. These designs include the Vans x Peanuts Slip-On, Vans ATCQ Slip-On, Vans x Mastermind Slip-on, Vans x Metallica Slip-on, Star Wars x Vans Classic Slip-on, and Vans x Murakami Slip-On LX - Gold Skull. Introduced as Style38 in 1978 with the signature side stripe and a high-top silhouette, the design took skating functionality up a notch with cushioning all the way above the ankle where most skaters often get injured. Aside from the added feature, the shoe also offers additional customization with the extra surface area where skaters would often doodle or spray paint their art into the SK8-Hi. Through the years the shoe had different looks but the most popular colorways and collaborations of the SK8-Hi includes the Taka Hayashi x SK8-Hi Engineer LX, Taka Hayashi x Pendleton x Vans Vault SK8-Hi, Vans x Bodega SK8-Hi Instant Winner, Vans x Marc Jacobs SK8-Hi, Concepts x Vans Syndicate SK8-Hi, and Bad Brains x Supreme x Vans SK8 Hi. The creation of the Vans Half Cab is a result of the brand’s keen eye for innovation by adapting to the needs of the skateboarding community. The first signature skate shoe produced is the Vans Steve Caballero released in 1988. Caballero, the former member of Stacey Peralta’s Bones Brigade, was tapped by Vans to wear the padded high-top Caballero shoe. As the first signature skate shoe, the Cab initially gained success with its superior cushioning and protection features for the feet. However, over a few years the company and Caballero, himself, noticed that the high-top kick was modified by some skaters who wanted more freedom of movement when doing their jumps. Caballero saw that his pro skating shoe was often cut and slashed at the collar and duct-taped by skateboarders to perform quick flip tricks better. The Half Cab had several makeovers since its 1980s run that include the “Metallic Silver" Supreme x Vans Half Cab, Trap x Vans Half Cab Pro, and Carhartt x Vans Half Cab. Despite its minimalist and often simplistic designs, Vans sneakers are known for their exceptional quality and remarkable craftsmanship that is coupled with tried and tested footwear manufacturing practices. Here are some of Vans’ sneakers technologies that have kept the brand a beacon of quality in producing footwear for several active sports today. Vulcanized construction. Since the company was established, most of the Vans sneakers produced today were made through this traditional manufacturing techniques. The same process continues more than 50 years later with shoes made in factories in Vietnam and China contracted by the American firm. Vulcanized construction involves heating rubber to create cross-links in the rubber compound and bonding them together. The result of this bonding process is a vulcanized sole that is tough, flexible, stretchable and ready to wear. Wafflecup sole. Vans introduced the first vulcanized cupsole in 2012. The new signature Wafflecup technology used in many professional skate shoes today combines the best-vulcanized outsole qualities with the support and durability of a cupsole and the superior board feel and grip of the traditional Vans vulcanized shoe. Ultracush. Many Vans sneakers use the in-house flexible insoles that are lightweight and provide excellent impact protection and resistance. The technology ensures superior cushioning by reducing the weight of the shoe because of lesser use of rubber compared to the regular insole. It also gives skateboarders a balance between board feel and damping resulting in overall comfort and increased support in running tricks and jumps. Duracap. The Duracap material is used mainly in high-abrasion areas to reduce friction and deliver a longer-lasting shoe. By strengthening often strained parts, the rubber reinforcement underlays in this high-wear areas can withstand a massive beating and abuse while enduring harsh conditions while skateboarding. LuxLiner. A comfortable extension of a Vans sneaker tongue, the LuxLiner is usually found beneath the upper at the toe box at the front area of the shoe. As it moves independently from the top, the signature LuxLiner offers stability to the feet, especially at the shoe interiors. Materials used in the liner are often breathable to allow air to circulate and keep the shoe breathable while also providing a snug fit and responsive board feel. Who are the current top endorsers of Vans sneakers? The Vans legends were the trailblazing skateboarders that had helped pave the way for Vans sneakers to be known globally. The likes of Tony Alva and Stacey Peralta of the iconic Z-boys started the trend when they helped design the first skate shoe the Vans Era in 1976. Soon other names like Steve Caballero, Ray Barbee, John Cardiel, Jeff Grosso, and Christian Hosoi were also able to help design and don the favorite American skate shoe brand. Among the shoes that came out in honor of these legendary skateboarders include the Caballero and Half Cab for Steve Caballero, Old Skool Pro 50th '92 and Vans Era 46 for Ray Barbee, the Era Pro and SK8-Mid Pro for John Cardiel, Vans SK8-Hi Pro and Era 46 Pro for Jeff Grosso, and also a SK8-Hi Pro and Era Pro for Christian Hosoi. Vans signature professional skaters include Kyle Walker, Anthony Van Engelen, Tony Trujillo, Chima Ferguson, Geoff Rowley, and Gilbert Crockett. These pros were the crème de la crème of the new generation of professional skaters who have been given a chance to help design and have pro-skate shoes named after them. These shoes include the Vans Kyle Walker Pro, Vans AV Rapidweld Pro, Vans AV Classic Pro, Vans TNT 5, Chima Ferguson Pro, Vans Rowley Pro, and the Crockett Pro 2. Professional skaters that have been in the skateboarding circuit and has been top endorsers of Vans in recent years are Chris Russell, Ronnie Sandoval, Rowan Zorilla, Lizzie Armanto, Alex Perelson, Pedro Barros, Omar Hassan, Jason Dill, Elijah Berle, Dustin Dollin, Daniel Lutheran, Curren Caples, Chris Pfanner, and Andrew Allen. While these riders have not been given the opportunity have a Vans shoes named after them yet, they have been evident in wearing iconic Vans silhouettes as part of the professional team of skaters sponsored by the House of Vans. What does the ‘Off The Wall’ slogan mean? Vans’ brand slogan ‘Off the Wall’ was first used in the 1970’s when the brand was just established and slowly gained popularity among the skateboarding community. The term ‘Off the Wall’ was coined after skateboarders leaped to the air in their boards and coming off the wall while skating in drained pools. Now after five decades of existence, the brand has retained the ‘Off the Wall’ slogan in their company logo with a more modern meaning that symbolizes the youth culture and a lifestyle focused on creative expression and freedom. What is the difference between Vans Pro and classic Vans sneakers? Classic Vans sneakers are characterized by their heritage design and often in OG materials and design. Vans Pro sneakers, meanwhile, are classic sneakers that were upgraded with usually more durable soles and upper with special reinforcements made in high-wearing areas. The Pro skating sneakers from Vans also had improved cushioning and impact protection so that skaters get to do their jumps and tricks with more protection to the feet. How does the company size Vans shoes? Vans sneakers are sized according to the US standards, as measured on a Brannock device. Vans shoes also run true to size. Men’s sizes range from 3 to 16 while women’s sizes range from US size 5 to 12. Kids sizes range from US size 3.5 to 6.5. In what widths are Vans casual shoes available? High-performance Vans sneakers tend to fit snug that others with wide fit would order a half-size larger to get a better fit. Some Vans slip-on fits a bit tighter at first, but will eventually stretch after wearing or break-in. High-performance skate shoes like Vans tend to fit snug so that they fulfill their purpose. How do you spot fake Vans lifestyle kicks? Carefully inspect the essential details in your purchase from the packaging to the logo and design. Check the barcode and labels including the shoe size and country of production. Check on the price of the shoes. Vans sneakers usually start at $40 a pair, and unless you see them in sales and special offers from legitimate sellers they cannot be priced lower than this and could go above the ceiling in price for limited edition and collaborative designs. If you find these vans sneakers sold way below these prices, they are likely fake. Run down through the box and the package paper and see if they are in the right places like the box closing correctly or the packaging paper wrapped around the shoe at unboxing.Each pair of Vans sneakers also has a paper tag attached to it sporting the Off the Wall signature logo. Compare the fonts as well as the size of the paper tags. Any misspell on the text, or large tags is a red flag for counterfeit items. Browse through reviews on the retailer or dealer and verify their business online ensuring that they published their contact information, customer service, and return policy. Most importantly buy the shoes from authorized retailers or the Vans online store. Look for essential branding details that include company trademarks on the side of the vans sneaker. Another one printed on the plastic at the back of the shoe and the logo at the sneaker insole. Check on errors on trademark from the font, spelling, and colors of the brand. While shades of the brand sometimes vary, the font should always be consistent. Also just to be sure, look for dark and quality printed logo on the insole that is easy to read, bright, and in darker colors. If you see them faded or not written well, you may have spotted a fake Vans sneaker. The trademark outsoles of the Vans sneakers have rhomboids and diamonds as interlocking patterns while a three-letter country code can be seen in one of the rhomboids. The three letter country code should be the same as the one printed on a sticker found inside the shoe box. As to the stitching, look for tight and even stitching. Since Vans sneakers are often used in skateboarding, they should have double stitching. If they have uneven stitching or double stitching in one hole or have variable distances between the stitches, the sneakers are likely fake. Check on the shoelaces as they should be firm to the touch as fake ones always have soft laces with some runs and questionable quality. Rubber collars on the toes should still be present to protect the shoe from wear and tear. While the rest of the rubber is smooth, the toe part should have a rough texture. There should be a little gap in between the rubber collar and the cloth of the shoe. The gap is often composed of a small layer of smooth plastic while fake Vans sneakers usually extend all the way to the canvas without any gaps. Compare the shoes with any recent original ones that you might have. Shoe angles bend a bit upwards that the toes face upwards. If the bottom of the shoes is flat, they are likely fake. Toes part should be bendable and press on the heel and toe is possible so that the front and back of the shoe touch. What is the size conversion between men’s and women’s sizes? Shoes for men run a size and a half larger than women’s. Women need to order 1.5 sizes down to fit correctly. Women would often buy the men’s sizes in specific shoes although most Vans sneaker designs included both men’s and women's sizes on every Vans sneaker. Why do prices vary on the same style of Vans sneakers? The prices of Vans sneakers range from the cost of Youth sizes to Men or Women sizes as well as the materials used for the shoe. Special Vans sneaker collaborations and limited edition designs of various styles of shoes also vary due to materials used and shoe demand variables. Where are Vans shoes manufactured? While Vans is an American manufacturer of skateboarding shoes based in Costa Mesa, California, the bulk of its shoes are sourced overseas. The Vans shoes are mostly manufactured in factories in Vietnam and China while a few shoes are being produced in the United States. What’s the difference between a regular vulcanized sole and a Vans waffle cup sole? Vulcanized sole construction involves heating rubber to create cross-links in the rubber compound and bonding them together. The result of this bonding process is a vulcanized sole that is tough, flexible, stretchable and ready to wear. Meanwhile, a waffle cup sole combines the vulcanized sole with the support and durability of a cupsole resulting to a superior board feel and grip of the traditional Vans vulcanized shoe. How do you clean Vans shoes? Canvas sneakers could be a challenge to clean if you don’t know how to wash them properly. Remove all shoelaces and inserts from your Vans sneakers. Remove visible dirt using a soft brush and rinse them with warm water. Use a mild detergent and gently scrub on the soil. Be careful not to brush off hard to affect the design and details of the shoe. Rinse the shoe with fresh water from the tap. To machine wash your Vans sneakers, place them on a gentle spin at the washing machine with the footwear encased in a bag used for delicate items for a few minutes. Air-dry washed shoes. You may also opt for shoe care products by Vans like the Vans Water and Stain Shield and Vans Shoe Refresh. The Vans Shoe Refresh is a formulated spray to deodorize and freshen up all footwear and helps keep them smelling their freshest. The Vans Water and Stain Shield Spray, meanwhile, provide an invisible barrier against moisture and stains and is ideal for protecting leather, suede, nubuck, cotton, canvas, and nylon uppers used mostly in Vans sneakers.